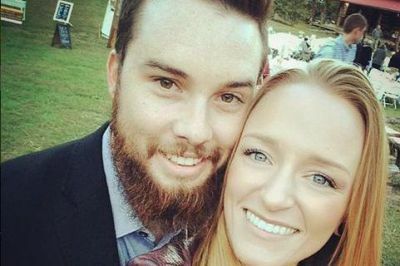 The photographer that will be shooting the wedding of Teen Mom OG stars Maci Bookout and Taylor McKinney just made a big blunder: she accidentally revealed the date and location of the wedding before Maci and Taylor did! Although Maci has stated that she and Taylor plan to get hitched in early October, she had not revealed the actual date or the location of the wedding. (She did recently say, though, that she would be having a destination wedding.) The couple has basically stayed mum on the rest of the wedding details (except to let fans know that the festivities would be filmed for ‘Teen Mom OG’). Unfortunately for Maci and Taylor, the photographer they used to take their maternity photos, whom Maci has repeatedly stated will also be photographing their wedding, inadvertently exposed Maci’s wedding date and location via several posts to social media and her official website. Apparently, the photographer was booked to photograph another wedding on October 8, 2016, but eventually cancelled on that couple to photograph the wedding of a “high profile” past client whose wedding would be on national TV. The bride who was cancelled on was not happy, and wrote lengthy posts on Facebook and Reddit to describe what happened between her and the photographer. (It’s basically a “she said/she said” between the other bride and the photographer, so the true story of what happened is sort of unknown). The photographer later confirmed that the “high profile” past client was, indeed, Maci. The disgruntled bride’s wedding is scheduled for October 8, and according to the photographer, it is the same date as Maci’s. In addition, the photographer’s website states that she will be shooting on location in Tallahassee, Florida, from October 7-9. This proves that the “destination” of Maci and Taylor’s wedding will be Florida! While there doesn’t appear to be any connection between Maci and Taylor and Tallahassee (that The Ashley can find, anyway), the city does offer some amazing wedding venue options, including Southern plantations, beautiful hotels and outdoor venues. Before the wedding, though, Maci and Taylor will welcome their son Maverick. Maci is currently nine months pregnant and will be giving birth very soon. As The Ashley has previously reported, Maci and Taylor will be sharing their wedding month with Teen Mom 2 couple Chelsea Houska and Cole DeBoer, who are getting hitched in South Dakota in early October. Maci’s ‘Teen Mom OG’ co-stars Amber Portwood and Matt Baier have also stated that they plan to get married this October. Oh come on, the photographer gave you plenty of time to find a new one before the wedding. My photographer canceled the night before my wedding and we managed to pull it off. A friends photographer couldn’t make it because of a sudden blizzard, and she managed to pull it off too. Stop sulking. Gah! Just a few months left for Amber’s eyes to open. She’s actually going to marry him. No idea who is going to pay for it (probably MTV, tabloids and sponsors) as they are both behind paying either tax or child support but it’s going to happen. Oh jezus god Amber, if you only had a glass ball, you would be able to throw it at his head for what he is going to do to you. This whole wedding is BS…just like her being 9 months pregnant but just found out in…what was it January or February? !Smh and Taylor all of a sudden, mid second pregnancy decided all on his own to marry Maci…sigh. Is there only one wedding photographer in the whole world? A professional one that doesn’t cancel the average bride after coming to an agreement and accepting a down payment might be hard to find it seems. Who does she think she is? Oh, you are a nobody, I like to work with high profile clients. I can see her side though. it’s a rare chance for her photos to be seen by millions. mtv will be filming, so she’ll probably be on tv, and you know maci will post her pics everywhere and say who did them. a photographer doesn’t get that kind of exposure much, esp as there are SO many photographers now. she should’ve given the down payment back when she told her, but this is plenty of notice to line someone else up. What do you think that guys beard smells like? I knew it was pretty close! Just off by four days. Hmm I was all Team “whatever the other bride’s name was” until I read the photographers (loooooong winded) description of the situation on Instagram and poked around on her page a bit more. It sounds like she might have a point and she sounds like a really sweet and humble person. But yeah, it’s she said/she said, so who knows. I think it’s fishy she didn’t give any details about what the bride supposedly did that was so unacceptable, why she felt that the bride didn’t like her and how it was “confirmed” that the bride was out to get her and her business. If you are trying to defend yourself and you have legitimate examples of the other person being nasty why wouldn’t you share those? October will be a busy month for Teen Mom….huh? I don’t care one way or another about Maci. But I don’t get what the big whoop is with this photographer. Her photos are average at best and her site makes her sound amateurish and immature. The other bride will probably be thankful this happened. Agreed. Her photos are really uninspired and obvious. Nothing 500 other photographers couldn’t do. She’s mediocre at best. Regardless of how I feel about Maci, the blame shouldn’t be placed on her. It seems Maci just wanted a photographer she has already worked with, who happened to already be booked. The photographer is the one who chose who to photograph and who not to. Unless she forced the photographer to dump the other bride, which is just pure speculation, the decision was ultimately up to the photographer. Wasn’t Maci and Ryan’s wedding supposed to be October 7th? And people are already blaming Maci. Look, I know this chick has her issues (cheers!) But we can’t blame her for this one. The photographer was the one who made this decision. So the photographer dumped the previously booked wedding for Mac and Taylor?? Hope she gets sued by the disgruntled bride!